Last week... at 2210hrs on the 21st October... I posted the above tweet. Unbeknown to me... it cause a wee flurry of activity. I should have explained that night or the following day... but I got sick. I do owe those who were concerned about me an explanation... so the following in an excerpt of an email I sent Katherine Sonntag, the West of Scotland Salvation Army's Divisional Youth Officer. Before you read on... please let me assure you that I count Katherine a friend and have nothing but love for her. She has been extremely supportive over this... displaying a level of empathy that was and is very encouraging. She was and continues to be very easy to deal with and is someone I am proud to know. This isn't a case of me not being asked... to my knowledge, no one has been asked yet! Its more appropriate to think that I no longer feel I have what is necessary to give. As an individual I am, if I can be honest with myself, spiritually malnourished. I am fully aware that I need to feed and am trying to do so... but I am not getting what I need to sustain me. I want the willingness that my kids have. I want to have the eagerness back. How can I seek to feed others when I am malnourished myself? You can only give out what you have put in... and I can only run on empty for so long. I need to be honest about how long I have been running on empty. That said... I am struggling with the call to Summer School. I believe it to be a true privilege to be part of... but am unsure if I have anything to give. With Paul & Jen not going... I am scared that I have no one in my immediate support group to keep me on the level. There were times in August where I hated who I had become... and it was Paul who challenged me and kept me in check. Previously it was Olwyn. That said... there were times where I loved what I did... and the cells were a major factor in that... but the truth is I am not a musician and I am not an actor... and I believe there are others more capable of doing what I did. To compound this... I no longer get 30 days holiday... and now only get 28 days. I can't afford to "buy" the two extra days... and need to give my time to my family. You wouldn't believe how many flippin' holidays these we'ans get. 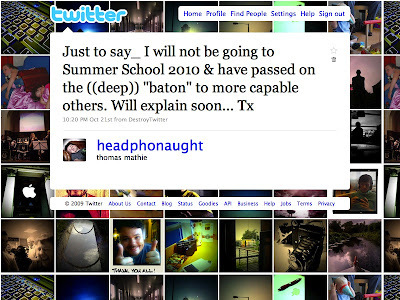 So it saddens me to say this... but I will not be available for Summer School from 2010 onwards. I don't have it in me to continue... I don't think I have anything to add... and I no longer have sufficient annual leave days to give. I agree with Laura Amy. I have mentioned your gifts before but would just say that there are people who need to know what the Bible says to their situation, to be with someone who can share compassionately without criticizing or judging and not to settle for mediocrity. Spend time with God regularly, consistently and humbly and He will work through you.